Network with people interested in permaculture design within any of New York's counties located north of New York City. Permaculture practitioners are welcome to join, share ideas and projects, and promote local events. Please limit your contributions to messages directly related to permaculture ideas and activities. Early Birds! Fall Permaculture Design Course Registration ~ Save $200 if registered by FRIDAY! Fall 2018 Permaculture Design Certification Course with Sowing Solutions in Western MA! ~EARLY BIRDS! Start registration by this FRIDAY to save $200 off tuition! Gather the skills to design for abundance in your home landscape and for resilience in our communities. Your registration in this course will provide you with: skill shares, discussions, design activities, experience in orchards and forest gardens, skills to create new gardens, natural building visits and hands-on activities, numerous tours of local permaculture sites, immersion in community life, stories and presentations, food preservation and medicine making workshops, mapping techniques, networking opportunities, and a certification in permaculture design. This course is offered by Sowing Solutions, who is celebrating over a decade of educational permaculture programs. • Students of this PDC will learn first-hand about working with design clients and conducting an ecological design. Participants will be guided through the ecological design process alongside a team of professional designers and educators. • A study of permaculture with Sowing Solutions includes visits to numerous demonstration sites such as Sirius EcoVillage, Wildside Cottages and Gardens, and Hickory Gardens. You can evaluate and learn from these leading northeastern permaculture demonstration sites ~ these sites have been growing and evolving for nearly a decade. • Gaining your internationally recognized certification with Sowing Solutions is an experience of empowerment, support, inspiration and skill building. • All that you learn in this course can be applied at your home. If for some reason you need to miss a day, don’t worry because you will still be qualified to complete your certification. If you need to miss more than a day, please let us know ahead of time, as we have ways for you to make up certain sessions and there can be alternate classes for you. We are truly happy to be hosting the course now at the Sowing Solutions Community Permaculture Hub and Design Studio in the village of Shelburne Falls. You will have an opportunity to practice ecological design for residents in the Village! We will be meeting for class sessions at Sowing Solutions Design Studio, 8 Deerfield Avenue, Shelburne Falls, MA 01370.. There will be a few days during the course when we adventure out on field trips to visit Wildside Cottage and Gardens, Sirius EcoVillage, Hickory Gardens, etc. We have reserved a number of local guest houses for you, as well as air bnbs private or shared rooms, and a local farmhouse with dorm accommodations~ so we will need to know who is staying overnight as soon as is possible to arrange your accommodations. Our hosts have set up special discount pricing for our students, hooray! If you are planning to commute, please also let us know your plans. Accommodations range from $25-$65 per night, based on your selection of a shared room, private room, location in town within walking distance, or a 4 minute drive from the town center to a guesthouse/ farmhouse with private rooms, dorms, or camping options, etc. Camping is also an option for $10 or $15 per night. Attached you will find the course registration form. Please fill this out today and return to us by email, or print it out and mail it to Sowing Solutions, 5 Bridge Street, Shelburne Falls, MA 01370. Locally sourced and organic lunches will be prepared for you and this is already included in your tuition. Breakfast will be prepared for all overnight guests only. Dinners are an additional fee and all students (commuters and overnight guests) are welcome to sign up any or for all dinners. http://www.PermacultureSeries.org, and please set up a time to chat with us by phone ~ we are delighted to answer questions about this educational event, and to help you with fundraising or with logistics, etc. 1. Fill out the registration form (see below) and return to us by email or postal mail at: Sowing Solutions, 5 Bridge St, Shelburne Falls, MA 01370. We are available to chat by phone if you have further questions 🙂 Once we receive an email from you, we will send you the brief pre-course assignment and all the arrival details as soon as you register. It will be wonderful if you can attend this inspiring and informative educational event! We will have a number of interesting design projects to work on together, and we have many existing permaculture demonstration sites to visit. The weekend series format of this course gives us a chance to correspond with you during the months between the class sessions, and provides students with ample time to integrate the new course material. The three weekends in session are opportune times for sharing skills, resources, inspiration, networking, and for forming new and lasting friendships. Visit our website for more course details, http://www.PermacultureSeries.org, watch out our 2-minute video about this course, learn about the fundraising support that is available, and join us for a fun and informative weekend series course that starts this April! Attached here is a detailed Course Information Packet. If you have any questions, we are delighted to talk with you by phone, or correspond by email… and we look forward to meeting you! Please email this form to permacultureseries@gmail.com OR send via postal mail to Sowing Solutions, 5 Bridge St, Shelburne Falls, MA 01370. Mail all tuition and accommodation fees to this same mailing address. Receipt of tuition confirms your seat in the course. Will you be a Commuter or Overnight Guest? If an overnight guest: Male or female dorm at a local farmhouse? Private room in a local guest house? Camping? 11 acre small farm 15 min. from Albany. Hi Michael, This was sounding good until I got to the room rental rate. Do they want someone to pay them to develop their property? Did I get that right? Does using Permaculture principles to create a food forest and sustainable homestead sound exciting to you? Come join us on our 7.5 acre property in Trumansburg! Three of us started this project last summer, and we are looking for the right person/people to co-create it with us. Some of the things we’ve been working on outside are: building a small greenhouse, creating Hugelkultur beds, rainwater catchment, digging a pond, growing trees to plant on the property, starting to manage the woodlot, building a woodshed, and making very good use of the piles of woodchips and leaves our friends have delivered. Indoors we’ve been: building a root cellar, cooking up a storm, processing and preserving foods we’ve grown, building a hearth/installing a woodstove, doing planning for this growing season (including designing an outdoor kitchen and ordering chickens and mushroom spawn), and generally fixing up this 138-year-old house, making it a more efficient and interesting living space! The current residents are the land owner, a musician in her 50s who works from home for a non-profit film company, and a couple in their twenties who are farmers, artists, and cooks. We all share a passion for organic gardening, natural building, community living and the arts. Our vision for the land is to use Permaculture principles to create a bountiful and beautiful property that can serve as a model, and we’re starting to organize workshops that we hope will be of interest to the larger community. Our spacious 4-bedroom house sits at the edge of the village of Trumansburg, with woods, a large pond and creek access. The kitchen, living areas and bathrooms are shared by all, and we cook and eat together often (and we eat meat). There is plenty of room here for people to do their own projects – either for generating income or simply for fun! Ideal candidates will have some skills/knowledge to share and experience living in community. The most important factors are: like-minded individuals that are interested in learning and sustainability, willing to work hard, can be professional when needed, and most of all – have a positive outlook! If this living situation sounds intriguing to you, please send us an email that tells something about yourself and why you are interested in living here. We look forward to meeting you! On Sunday, August 27th at the Schuyler County Cooperative Extension Facility in Montour Falls, NYpermaculture activists will convene to share, network and learn. Your input is invited for the morning workshops and the afternoon discussion. This year, “diversity in approaches to permaculture” has emerged as a theme. We invite anyone who is using patterns in nature to inform their work to present a workshop or join in the discussion. Whether you use the word “permaculture” and work directly with plants, animals, and soil OR you are inspired by natural patterns in how you and your organization design human social and economic systems, you are welcome! The first half of the day will be spent in workshops. 45 minute blocks run from 9:30am-10:45am and 11:00am-11:45am. The 90 minute block runs from 9:45am-11:30am. To propose your workshop, send an email to <info@fingerlakespermaculture.org> with your name, a description of your presentation topic, and specify your time slot preference. Following the morning workshops there will be a 90 minute lunch break with food trucks in the parking lot. Throughout the day, a plant sale sponsored by Cornell Cooperative Extension of Schuyler County will take place outside as well. The second half of the day will commence at 1pm. FLPCI will share the seeds of a participatory conference format we have gathered from other regional permaculture convergences. We will explore the theme “How can permaculture best serve our communities?” using Open Space Technology (OST) facilitation. This non-hierarchical format allows you and the other attendees to create the agenda and self-organize around your own interests. ALL participants are invited to bring their wisdom, passions, or questions revolving around our theme to the mix. This session will start with an orientation, so please arrive promptly. Permaculture films shown in Ithaca and surrounding communities in New York’s Finger Lakes region. Regional Permaculture Convergence & Plant Sale at Cornell Cooperative Extension of Schuyler County in Montour Falls, N.Y. If you can accept visitors for a full or half-day and can explain to others how permaculture design and principles are demonstrated on your site, you may still apply to join the tour. We have a limited number of workshop spaces open so please contact us as soon as possible. Our sponsors have been crucial supporters the last three years of the tour leading a weekend of free events for those who cannot afford a donation. We are still seeking sponsors. 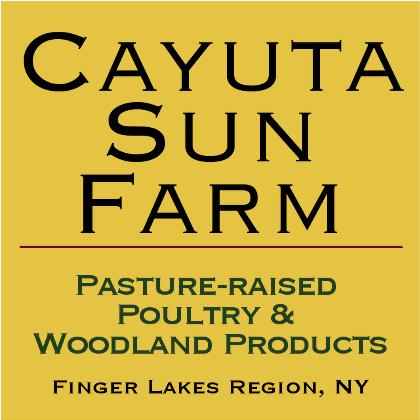 Visit FingerLakesPermaculture.org to learn about the Finger Lakes Permaculture Institute.